We're delighted to introduce you to twelve new Crystal Essences - these lovely new Essences cover a whole range of issues, energies and pathways for spiritual growth and development. The lovely Snowdrop Flower Essence is all about coming to terms with the pain of bereavement, separation, sadness and loss, and it helps to restore a sense of hope and joy for the future. The Energetic Alignment spray helps to bring all your subtle bodies, chakras and subtle energy points into greater alignment. It is an excellent spray to use before meditation or contemplation and enhances your connection with your inner wisdom and soul guidance. It is also a very effective spray to use when you feel energetically scattered, ungrounded and disconnected from yourself. This beautifully illustrated book is an updated version of Shimara’s original 1997 book of the same name. It is full of information about vibrational essences and how to use them for personal healing and transformation. The many colour photographs included in this book bring the frequencies of the essences fully into awareness and can be used as a resource to guide selection. From us all at Crystal Herbs we'd like to wish you all a very happy New Year. May 2019 bring you lots of love, happiness, joy and abundance! Valerian is a wonderful Essence for grounding. So if you feel a deep dis-connection from your physical body, often feel ungrounded or spaced out, have an inability to function fully in the world or a recurring feeling of not wanting to fully be here in the now, this would be a very helpful Essence. The Water Lily Essence works with deep feelings of isolation and loneliness. It helps to clear and release unexplained feelings of grief and sadness and deep old heart chakra blocks and barriers. Water Lily gently dissolves these old patterns & energies, bringing understanding and the ability to reach out to others once again. Azeztulite Essence expands perception and the ability to see beyond your normal confines. It helps open your connections with the Earth and increases your ability to use high frequency light. We're delighted to be stocking the new Bamboo device from Music of the Plants. The Bamboo is an instrument that gives voice to plant perception and consciousness. These amazing devices have been developed to allow you to listen to and interact with plants and more importantly, for them to interact with you. This summer we created three new essences from sacred geometric shapes; Sphere, Star Tetrahedron and Flower of Life which we been having fun testing out on ourselves and other interested folks. You can find these essences included in our new set of ten Platonic Solid & Sacred Geometry Essences alongside the platonic solid essences and two platonic solid combinations, Metatron’s Blend and Inner Light. These Vibrational Essences are available in a 10ml or 25ml size bottle and as individual Essences or as a complete set of all ten. We have also made all the essences in this set available as individual 30ml sprays. 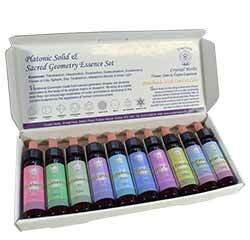 We have found that spraying these essences into our auric field is a very powerful way of using them. Our Essence Review for July is for the Hyssop Flower Essence. Hyssop alleviates deep feelings of guilt whether these are conscious or unconscious. It is only as we allow ourselves to confront the old memories to which our guilt is attached that we can begin to forgive ourselves and recognise that we have learned from the experience. This essence helps us to do this, releasing much mental and emotional tension in the process. Our Essence Review for June is for the Wild Iris Flower Essence. This is a really good Essence for those working with deep unconscious feelings of responsibility for the welfare of others or the planet. It’s helpful for where there are unresolved power issues, the need to change others, to be in charge or feelings of deep responsibility. Healing the Heart. Defence Patterns & Compassion for Yourself - a look at the energies of the moment and the importance of clearing and releasing old blocks in the heart chakra. Advanced Essence Practitioner Training Diploma run by Jackie Stewart. Catherine Keattch from Crystal Herbs is delighted to have been invited to provide a day’s teaching on Crystal Herbs Essences on the next Advanced Essence Practitioner Training Diploma, developed and run by our friend and colleague Jackie Stewart. Our Essence Review for this month is for the Sunflower Essence. Sunflower opens the heart chakra and balances the inner yin & yang energies. 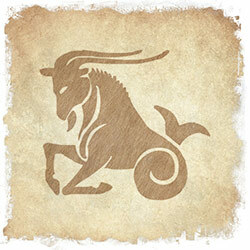 It helps out of balance male energies and transforms feelings of anger or hostility related to the father figure. Sunflower is also a helpful essence to stimulate the flow of higher wisdom and increase intuition. Our Essence Review for this month is for the Yellow Rattle Essence. The lovely Yellow Rattle is for those who carry an innate sadness and melancholy from this or previous lifetimes. It can often feel difficult to express the depth of this feeling and it can cause recurring and apparently unfounded feelings of hopelessness and despair. Flower & Gem Essence Suggestions to help you to raise your vibrational frequency and align with your highest potential. Paying attention to your energetic foundations, aligning with the consciousness of the heart and increasing your capacity to absorb high frequency light are all important when it comes to managing your vibrational frequency. The Healing Relationships Essence is for difficulties with intimate relationships, a lack of closeness and intimacy or an inability to trust in the relationship. It helps to promote greater intimacy & trust in relationships, dissolves defence patterns and supports the ability to build loving open hearted relationships. It's lovely to see the greens & browns of the countryside again after all the snow of last week and to finally be able to get back into Crystal Herbs today. We're sorry for the wait if you placed an order last week, but we're working hard to get all of the orders out asap, so your order should be with you soon! We're sorry to say that we're still experiencing real problems with the weather and therefore with sending out your orders. Following on from yesterdays report ( below); although it was no longer snowing this morning, there was a lot of wind blowing large snow drifts across the roads. 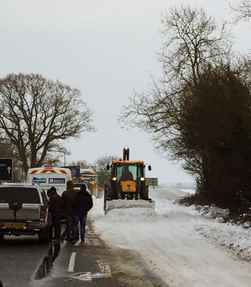 A number of us set off to try and get in this morning, but even some of the main roads were blocked and the two miles of side roads up to Crystal Herbs, where there will have been no gritting or snow ploughs, were again impassable. The good news though is that the weather is set to improve significantly over the weekend so we will definitely be back in on Monday and will be dispatching all of your orders as soon as possible. We apologise to all of you waiting for your orders and thank you for your patience. For perhaps the first time ever, we have had to have a 'snow day' here at Crystal Herbs! While we made it in for a while yesterday, we literally had to dig the car out of the carpark, and then again in the drive way, before retreating home in the heavy snow. Today the roads into Crystal Herbs were impassable, so as a result we are a little behind with all of your orders, but we are hoping to be able to get in tomorrow and get them all dispatched! Our Essence Review for this month is for our Inner Focus Essence. This Essence helps to calm your mind and emotions so that you can deepen your experience of meditation. It will help you to find the inner pathways that will deepen your experience of meditation, bringing a greater sense of centeredness and alignment with your soul. Essence Suggestions - as we transcend our old polarities and polarity consciousness, we will inevitably come up against some of our deeply held old belief systems. So, here are some essence suggestions to help you dismantle any ‘road blocks’ that you might encounter, helping you to move beyond these old patterns as easily as possible. Our planet is currently receiving a huge amount of high frequency energies which are designed to stimulate awakening and expand personal and group consciousness, however as they are filtered through our differing levels of consciousness they have the potential to create a variety of effects. We recently attended this fascinating workshop which was put together to explore the field of plant communication and plant consciousness. You can find out more about the event in blog report below. Do you use Pinterest? If you do use it or if you don't but are interested anyway(! 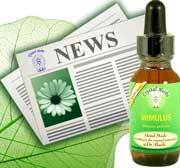 ), then we've just created a new Pinterest account for Crystal Herbs. We're adding plenty of new images all the time, so do check it out. Our first Essence Review for 2018 is for the Male Essence from our Divine Harmony Essences range. This powerful combination is all about strengthening & balancing your inner masculine energy (applicable for both women & men!) It releases old patterning that might prevent you from fully using your inner masculine qualities, such as strength, logical thinking & initiating action. 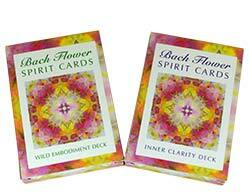 The Bach Flower Spirit Cards are a wonderful set of new Bach Flower Remedy cards produced by Jackie Stewart and Jason Smalley. The beautiful flower images on the cards will speak to your soul whether you’re a Bach Flower Remedy enthusiast or a flower essence practitioner. The cards have been designed to help you to choose the Bach Flower Remedies intuitively and use them dynamically for yourself, family, friends and clients. The Inner Clarity Deck (Bach Flower Remedy images on white background) and The Wild Embodiment Deck (Bach Flower Remedy images on nature background). As regular customers may notice, we have just had a small price increase. Since our last price increase in 2012 the market has changed a lot, and so have the costs. So although it's not something that we like to do ( or do often for that matter! ), we have had to implement a modest price increase so that we can keep everything in balance. We hope that you will continue to enjoy using our range of Flower, Gem & Crystal Essences, and as ever, if you need any help or advice, please do be in contact and we'd be pleased to help. In this month’s Essence Suggestions, we are going to explore some combinations that work with the various aspects of reclaiming your personal authority and strengthening your sense of yourself. A particularly important aspect of our foundation that we could consider as we check in this month is that of personal authority. A good question to ask yourself might be; how much do I occupy the driving seat of my life? For many of us this is still somewhat of a work in progress and something that the energy flow this month could well bring into greater awareness. Our latest Essence Review is for the Female Essence. This powerful combination works to strengthen & balance the inner feminine energy in both men & women. It dissolves the old patterning that prevents the full use of feminine qualities such as creativity, intuition & nurturing.